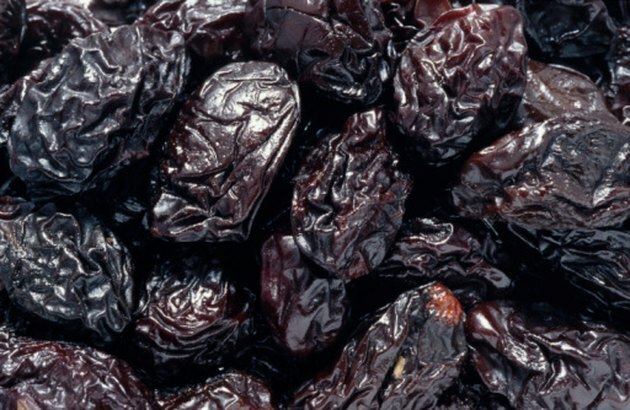 Can You Eat Prunes If You Have Acid Reflux? Food passes from your mouth to your stomach through a muscular tube called the esophagus. A one-way valve at the junction of your esophagus and stomach normally keeps food and stomach acid from regurgitating into your esophagus. A faulty gastroesophageal valve leads to acid reflux, which typically occurs after eating and causes heartburn. Although certain foods and eating habits aggravate the condition, prunes are a healthful and safe food to include in your diet if you have acid reflux. Overfilling your stomach creates internal pressure that may provoke acid reflux. Occasional acid reflux is common, but persistent reflux that occurs more than twice a week is considered gastroesophageal reflux disease, or GERD, which can eventually lead to more serious health problems. Eating frequent small meals and snacks instead of three large meals helps prevent overextension of your stomach and acid reflux. Because prunes are a dried fruit, a quarter-cup counts as a half-cup serving of fruit. Similarly, a half-cup of prunes counts as a 1-cup serving of fruit. You may want to consider eating prunes as a snack rather than an add-on to a meal to prevent overfilling your stomach. Gravity can be your best friend or worst enemy when you are living with acid reflux. An upright position helps keep food and stomach acid from refluxing into your esophagus. After you eat prunes or other food, stay upright to give the food time to pass into your small bowel. Avoid lying down to nap, read or watch television after eating. In addition to spacing your meals and snacks throughout the day, avoid eating prunes or other foods within three hours of your bedtime. This helps prevent nighttime acid reflux and heartburn by giving your stomach time to empty before lying down to sleep. If you have slow gastric emptying, you may need a longer period without eating before going to bed. Prunes provide you with an array of healthful nutrients, including iron, potassium, calcium and vitamin A. This dried fruit is also rich in dietary fiber, providing you with approximately 11 g in six whole prunes. Sorbitol and the natural laxative dihydrophenylisatin combined with the fiber in prunes help promote regular bowel movements. High-fat foods delay stomach emptying, which can increase the likelihood of you experiencing acid reflux symptoms. In addition to avoiding fatty foods, weight loss may help control acid reflux symptoms if you are overweight or obese. Sugar-free, non-mint chewing gum can reduce reflux-related heartburn by promoting saliva production, which rinses stomach acid from your esophagus. Avoid alcohol, which irritates and inflamed esophagus. If you have persistent or recurrent heartburn, see your doctor to determine the cause. Can You Eat Cucumbers With GERD?